If you’re a family caregiver of a loved one with Alzheimer’s or another form of dementia, wandering is a problem you have probably had to deal with or worry about. The stories we hear about confused seniors wandering cold streets at night are frightening. So, what can you do to lessen that risk and to ensure your loved ones’ safety? Home Instead Senior Care has put together a comprehensive resource for families at www.preventwandering.com. Included here is a technology tool called the Missing Senior Network, a free web service that can help locate a loved one who goes missing or becomes lost. You might say, “this sounds interesting, but it seems too techy.” Let me give you an example to show you how easy it is. Let’s say my mom, Diane Brunt, has dementia and has wandered off a couple of times. Nothing really bad has happened yet, but everyone in the family is worried now that the weather is turning cold in Idaho where she lives. 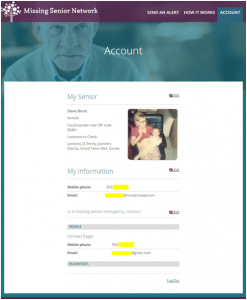 First, I go to www.preventwandering.com and click on “Missing Senior Network.” I’ll be asked to set up an account with an email address and a password of my choosing. I’ll get an email to complete the registration. 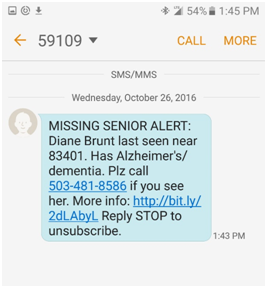 When the dreaded moment arrives, and my mom is nowhere to be found, I will login to www.missingseniornetwork.com and click on “Send An Alert” at the top. This will immediately notify all my emergency contacts that Mom is lost. Alerts go out by text and email.